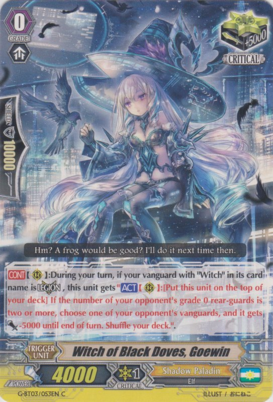 Welcome to the first part of our discussion and introduction to the world of Vanguard! In these articles, we’ll be trying to explain the rules of the game in a logical and easy to follow fashion, explaining potential points of confusion along the way. Vanguard is a trading card game with several interesting features. Players use various cards named units to fight on their behalf, the most important of which is the Vanguard. This is a unit which becomes stronger over the course of the game and can never be destroyed, but which slowly takes damage from the enemy’s attacks. When it takes six damage, represented by losing the top card of the deck, the player who owns it loses. The primary form of defence in the game is to use cards from the hand to protect units, so this means that, in order to attack more strongly, that player sacrifices defence. There are no ‘spells’ or ‘sorceries’ in the game, so all special effects come from the units themselves. Finally, some cards in the deck have special effects when they are revealed, named Trigger Units, which can range from doing more damage to drawing a card to healing the damage inflicted over the course of the game. Units come in a variety of different forms, but the most important distinction between them is their Grade. There are currently five different Grades: 0, 1, 2, 3 and 4, although, for the time being, we will only concentrate on 0-3. This is an example Trigger Unit, Witch of Black Doves, Goewin. 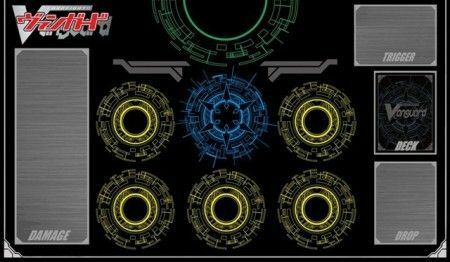 The top-left corner states its grade and ability (Boost, ), while the top-right corner states its Trigger effect (Critical and +5000 Power). Only Grade 0 units can be Triggers, and all decks have to run exactly sixteen of them. 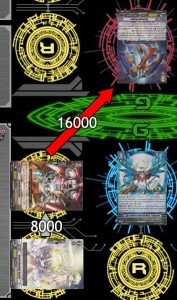 The middle-left box (with the sideways text) states the card’s Shield value, which in this case is 10000. Grade 3 and 4 units have no shield value. 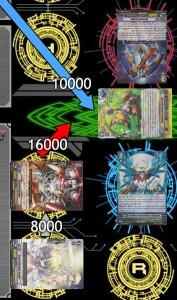 The white-tinted box is the card’s effect, which many (but not all) units have. The bottom-left corner contains the card’s Power (4000), the bottom-middle the card’s Critical (damage on attack), and the bottom-right the card’s Clan (Shadow Paladin) and Race (Elf). By contrast, this is an example Normal Unit – the Grade 3, Chronojet Dragon. This card has no Shield value or Trigger effect, and also a different ability (Twin Drive, ). Its power is significantly higher (11000). This card is a more offensive unit, but doesn’t have any Shield. The ability symbols are common to all units of that grade. 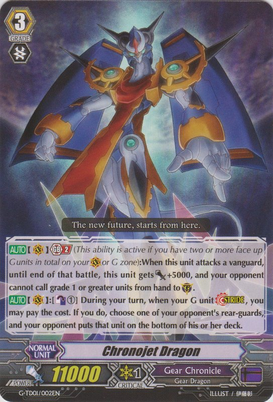 Grade 0 and 1 units have Boost ( ), which allows them to increase the Power of other units when they attack; Grade 2 units have Intercept ( ), which allows them to guard even when on the field; Grade 3 units have Twin Drive ( ), which allows them to check two triggers when they attack as a vanguard. The field for Vanguard is somewhat unusual compared to other TCGs. It features one ‘Vanguard Circle’ (which is the blue upper-middle circle) and five ‘Rearguard Circles’. Each circle may only contain one unit (with the exception of Legion), and units may only declare attacks when on the front row (unless an effect says otherwise). Intercepting (the Grade 2 ability) is also only able to occur on a front row Rearguard circle. The back row can be occupied by any unit, but is most usefully occupied by Grade 0 or 1 units, who can Boost an attacking unit in the same column. The Drop Zone is equivalent to the Graveyard in other games, and is the location retired units enter. The Trigger Zone is a special ‘holding zone’ used when attacking or taking damage. The Damage Zone is where cards taken as damage are held. The game begins by both players choosing a Grade 0 unit from their deck as their first Vanguard, then shuffling and drawing five cards. Players look at their hand, and once before the game begins, may return any number of cards from it into the deck, shuffle, and draw back as many cards as they put back. This allows players to improve their opening hand, and is used to find units from each grade, as they are needed to strengthen the player’s Vanguard. When both players have performed this step, then the game begins with the first turn. The first two steps of the turn are to ‘Stand’ (turn any sideways units upright) and then to draw a card from the deck. This is equivalent to the ‘untap’ step of games such as Magic the Gathering. The Ride Phase is the point in your turn where you can improve your vanguard, increasing its grade. Units of higher grades tend to have higher powers, so it is really important for both offence and defence to get to grade 3 as soon as possible. A ‘Ride’ is where a player places a unit of the same or one grade higher as their Vanguard onto the Vanguard Circle. The previous Vanguard stays in place below the new one, creating a stack of cards known as the ‘Soul’. Riding can only be performed once a turn. During the Main Phase, units can be placed on Rearguard circles from the hand in an action known as ‘Calling’. 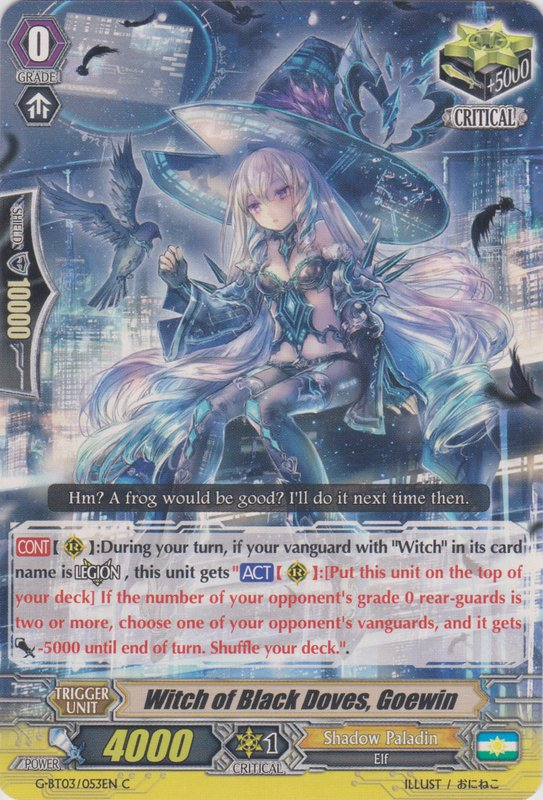 They can only be called if they are the same Grade or lower than the Vanguard (another reason why increasing the Grade of the Vanguard is vital), but other than that, as many can be called in a single turn as the user wishes. If a unit is placed on an already occupied circle, then the unit beneath it enters the Drop Zone. During this phase, units are able to move back and forth in the same column, trading places between the front and back rows), but cannot be moved between columns. Active (ACT) effects can only be activated during the Main Phase. The Battle Phase is when attacks may be declared. Units attack one by one if and when the controller wishes. Attacks may be directed against any unit in the front row, allowing players a choice between dealing damage and attempting to remove the opponent’s Rearguards (who enter the drop zone when hit). There is no ‘summoning sickness’ in the game, so all units may attack and boost on the turn they are called. Fighting in Vanguard works by comparing the power of the attacking unit with that of the defender, and then, if the attacker’s power is equal to or higher than the defending unit, the defender is hit. For example, if a 11000 power unit attacks another 11000 unit, then that unit is hit. However, units can boost others, which means that they can add their power to the unit in front, greatly increasing their power. In this example, the opponent’s Vanguard would be hit, even though the Rearguard’s own power is only 8000. As the unit behind the attacking Rearguard is a Grade 1 and is on the back row, it can boost the unit above it, adding its 8000 power onto the attack. Thus, they attack for 16000 when combined, which is easily enough to hit the Vanguard! When units attack or boost, they are turned sideways into ‘Rest position’, which shows that they cannot do that action again. Units can attack again on the same turn if an effect causes them to re-Stand, but, outside of Stand Triggers, these effects are rare. Most decks, therefore, will perform between one and three attacks a turn. Attacking units suffer no consequences for a failed attack, so, even if the opponent’s unit overpowers them, they will not be retired or take damage. Guarding occurs after the initial declaration of the attack, and before Triggers are checked. Guarding units are called from the hand to the Guardian Circle, which is between both players, or are moved there from the front row if they are Grade 2s using their Intercept ability. Here, the Gear Chronicle player has guarded the attack from hand using a 10000 Shield. The Shield Value of the card is added to the Vanguard’s power, effectively making the opponent’s Vanguard 21000 power. Thus, the attack of the Rearguard is blocked, as its power is too low to hit. No Drive Checks occur, as the attacking unit is a rear-guard, and the unit used to guard is retired and placed in the drop zone. In this way, units can only be used to guard against attacks once, so efficient defending is very important! When your Vanguard attacks, after the opponent has declared guard, you reveal the top card or two cards (if using Twin Drive) of your deck. If a Trigger is revealed, it activates – this is called a Drive Check. Triggers combine two effects when revealed, and these can be assigned separately. All Triggers have an effect to give a 5000 power boost until the end of the turn they are revealed, but also have a second effect. Critical Triggers make a unit do extra damage to the Vanguard should they hit, with each Critical increasing damage by one; Stand Triggers allow a Rearguard which is at Rest to stand (and attack) again; Draw Triggers allow the owner to draw a card; Heal Triggers allow the owner to remove one damage by taking it from the Damage Zone and putting it in the Drop Zone, provided that the owner has more or equal damage to their opponent. Cards revealed during a Drive Check are added to the hand, which effectively means that players draw two to three cards a turn if they attack. Even if your Vanguard’s power is too low to hit anything, it is still worth attacking to get these free cards! In this example, the Vanguard is attacking. This attack can be blocked with 10000 shield, but if the Vanguard were to check a Trigger, the added power would allow the attack to go through. If the attack hit, the opponent would take one damage. 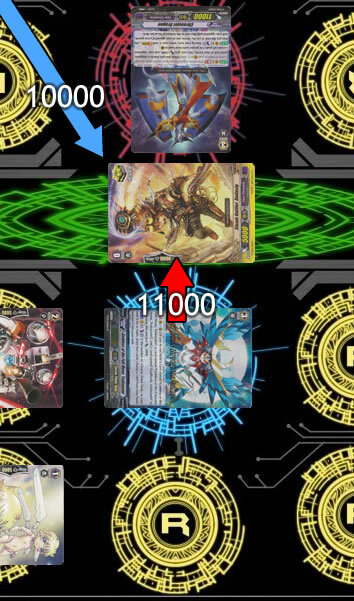 Damage is tracked by revealing the top card of the deck and placing it into the Damage Zone face-up, and any Trigger Effects take place at this time. For example, if you took a damage and revealed a Draw Trigger, you would still get to draw a card and give a unit an extra 5000 power until the end of the turn. It is worth noting that Triggers revealed in this way technically go to the Trigger Zone when being resolved, so Heal Triggers cannot heal themselves, as they are not actually in the Damage Zone at the time. Heal Triggers allow the player to survive taking their sixth damage, as they heal before entering the Damage Zone. So, in this instalment, we have covered Grades and their abilities, the Vanguard and Rear-Guards, set-up, turn structure, Trigger types, attacking, guarding and taking damage. Next time, we’ll explore card effects.